Xinhua reported that Ban also singled China out for congratulations in a phone call with Chinese Foreign Minister Wang Yi on Wednesday. China “played an important role” in the talks, Xinhua paraphrased Ban as saying. But what, precisely, was China’s contribution to the negotiating process, particularly given that media reports often simplified the talks into a debate between Iran and the United States? China is not a focus of the contradiction and that enables it to carry out active mediation in a more just and objective way. Especially at some important points when the negotiation met with the difficulties and reached the deadlocks, China had actively explored ideas and approaches to resolve the problems and put forward its own solutions from a perspective taking into consideration of the common interests of all parties. In other words, because China is a relatively neutral partner (Beijing has no interest in seeing a nuclear-armed Iran, but also frowns on the sanctions put in place against Tehran), it was able to act as a credible mediator when the talks deadlocked. At least publicly, China’s proscribed “solutions” read like little more than common sense (in one “four-point” proposal from June 2015, the second of Wang’s points is that negotiators must “advance the negotiation in the next phase”). Behind the scenes, however, it seems that China’s main function was to push back against the United States and Europe on the issue of sanctions relief. While China stood with the Western powers in insisting Iran give up its ambitions for nuclear weapons, Beijing (and Moscow) took Iran’s side in calling for more rapid sanctions relief, particularly from the conventional arms embargo put in place by the UN. As U.S. Undersecretary of State Wendy Sherman delicately put it, “the partners were not together” on the issue of the arms embargo, making it one of the last sticking points resolved in the negotiations. 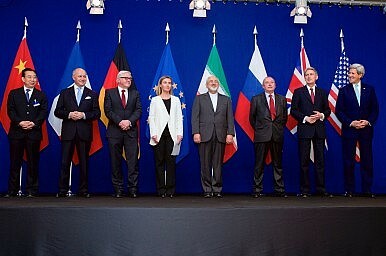 China and Russia also reportedly opposed the “snap-back” provision, which would allow the return of UN sanctions should Iran be found non-compliant–without the possibility of a Russian or Chinese veto. There are obvious economic reasons for this stance—both China and Russia hope to exports arms to Iran, and China also seeks access to Iranian markets and oil fields—but the philosophical rationale should not be ignored either. For China, the entire negotiations process represents a victory for its long-stated preference for political solutions over sanctions or other unilateral actions (see: the Philippines’ arbitration case regarding the South China Sea). Rather than willfully resorting to the use of force or sanctions, we should seek a political settlement and try to put forward a comprehensive and balanced package solution that addresses the concerns of all involved. While U.S. negotiators emphasize the importance of strict sanctions in bringing Iran to the negotiating table, for China the Iran deal is an example of negotiations achieving the desired result where sanctions had failed. That the talks happened at all–and especially that they resulted in an actual deal–is taken by Beijing as validation of its traditional emphasis on negotiations over coercive diplomacy. That, in turn, gives China hope that its preferred method for dealing with disputes can become more influential. Besides the Iran talks, China has also been experimenting with mediation in conflicts in South Sudan and Afghanistan, and has consistently called for negotiated settlements to protracted conflicts in Syria and Yemen. In his conversation with Ban, Wang said he hoped that the Iran talks “could serve as a positive reference for the handling of other international and regional hot spots.” He also promised that China would continue to play a responsible and constructive role in overseeing the implementation of the agreement, which Wang admitted on July 14 was “the main challenge” facing the deal.